Margaret Coel is the New York Times best-selling author of the acclaimed Wind River mystery series set among the Arapahos on Wyoming's Wind River Reservation and featuring Jesuit priest Father John O'Malley and Arapaho attorney Vicky Holden. The novels have received wide recognition. They have been on the bestseller lists of numerous newspapers, including the New York Times, the Los Angeles Times, the Denver Post and the Rocky Mountain News. Five novels have received the Colorado Book Award. THE SPIRIT WOMAN received the Willa Cather Award for Best Novel of the West and was a finalist for the Western Writers of America's Spur Award for Best Novel. 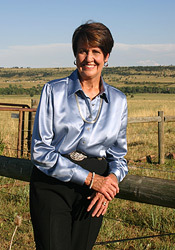 She is a native Coloradan who hails from a pioneer Colorado family. The West  the mountains, plains, and vast spaces  are in her bones, she says. She moved out of Colorado on two occasions  to attend Marquette University and to spend a couple of years in Alaska. Both times she couldn't wait to get back. Along with the Wind River mystery series, Margaret Coel is the author of five non-fiction books (two of which are featured on this site), including the award-winning Chief Left Hand, published by the University of Oklahoma Press. This biography of an Arapaho chief and history of the Arapahos in Colorado has never gone out of print. The Colorado Historical Society has included both Chief Left Hand and Margaret's memoir-history of railroading in Colorado, Goin' Railroading (which she wrote with her father, Samuel F. Speas) among the best 100 books on Colorado history. Her articles on the West have appeared in the New York Times, the Christian Science Monitor, American Heritage of Invention & Technology, Creativity! and many other publications. Speaking engagements on the people and places she loves best have taken her around the country and as far away as Australia. She visits the Wind River Reservation every year, "just to catch up with my Arapaho friends." She writes in a small study in her home on a hillside in Boulder. The window frames a view of the Rocky Mountains and the almost-always blue sky. A herd of deer are usually grazing just outside, and one summer a couple of years ago, a mountain lion made its home closeby. "Every day,"she says, "I drink in the West." More information found in a listing of interviews and awards. 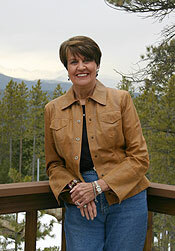 Margaret is one of the featured authors at the Tony Hillerman Writers Weekend. Margaret's autobiography and discussion of the people and events in her life that have influenced her writing can be found in Contemporary Authors, Vol. 222. Media: need a photo or book cover? Click here.